If you've been on the keto diet for any length of time, you may have heard of the mysterious Shirataki Noodles - the no or very low carb alternative to pasta and rice noodles. But what's the real scoop? We've put together this comprehensive guide with everything you need to know. Craving pasta or Pad Thai? Every dish in this picture has been created using no or low carb Shirataki Noodles. Eating healthier and losing weight can be a nightmare. Having struggled with weight loss for years after my third child, I was desperate for help. But with so much conflicting diet advice online, it was hard to find a solution that lived up to the hype and still satisfied my appetite. I was skeptical when I heard about Shirataki Noodles, the so-called miracle noodles. Zero or low calories? Low carb? Filling? Delicious? It couldn’t be true! I had to try them for myself…and then I was hooked. My philosophy is to enjoy life, and pasta makes me happy. However, my doctor told me that I was on a fast track to major health issues if I didn’t get a handle on my weight. He strongly suggested a low carb diet, and my heart sank. If you’re like me, you’ll understand my dilemma. Pasta is loaded with carbohydrates. Even small portions sent me into a craving spiral that was setting me up for morbid obesity, diabetes, and chronic constipation. But pasta is so darn tasty! Are Low Carb Noodles Right for You? If this struggle sounds familiar, this might be your solution, too. Let’s figure out if these low-carb noodles are the culinary miracle you’ve been searching for. Are you on a keto diet but love pasta? Low carb noodles fit perfectly into the ketogenic diet. Seeking a lower calorie pasta option? Some brands have zero calories and others have up to a measly 10 calories per serving. Need to boost fiber? We can all use more fiber, and these noodles generally have an impressive 3 grams of fiber per serving without added calories. Need to stave off cravings? Because these noodles move slowly through the digestive tract, they give that full feeling much longer than fast-digesting and carb-loaded wheat pasta. Pretty great, right? But let’s be honest, though. Low carb noodles won’t be right for everyone. First of all, if you’re a stickler for that perfect pasta texture, you may not appreciate the unique feel of Shirataki. Also, if you’re not worried about lowering your carbs or counting calories, regular pasta is probably fine for you. But it never hurts to try new foods either! Shirataki rice and noodles aren’t a new health fad. They’re a traditional Japanese food. Both the rice and noodles are made from glucomannan starch, which is extracted from konjac, or devil’s tongue yams. Konjac is also used to create high-fiber supplements, flour, and jellies. To help with portion control, these noodles come in pre-portioned plastic bags that need to be refrigerated. They usually say two servings per package, but even if you eat both servings, it’s still only about 20 calories. Constipation aid. Because of the high fiber content, these noodles can help battle or prevent constipation. Best of all, they're about 97% water; the rest is indigestible dietary fiber that adds bulk, keeps you full, and then passes right through you. Zero to low calorie and zero to low carb. Variety of shapes that mimic your favorite pasta such as spaghetti, macaroni, and fettuccini. There's even Shirataki rice! Texture variants. You can find miracle noodles made with the addition of tofu or chickpeas to alter the texture. This adds a little more fiber and a few extra calories. Texture issues. The texture can be off-putting if you're not used to Asian-style noodles. They're slick, slippery, and some even describe them as slimy. To me, they're more like glass noodles or rice noodles...perfect for Pad Thai. Gastric upset. Some people experience mild gastric upset at first. It can be mitigated or avoided by slowly introducing these high-fiber noodles into your diet instead of diving headfirst into a giant bowl. Some people experience no trouble at all. Cost. They cost more than boxed grocery store pasta. Scent. The liquid that accompanies the noodles has a slight fishy scent that bothers some people. Just rinse the noodles and dry briefly to reduce it. Here’s where we get down to the nitty-gritty. There are a lot of features and benefits to these innocent-looking noodles, and I want you to know them all. Let’s dive in with some common questions and answers. Click on the “Plus Sign” to reveal the answer to the most frequently asked questions about Shirataki Noodles. Like most noodles, these don’t really have much of a taste on their own. That works in their favor! They’ll easily absorb the flavor of whatever sauce you decide to put them in. Are Shirataki Noodles Difficult to Prepare and Cook? Not even a little bit! You can, of course, make the preparation as complex as you want, but the basic steps are simple and quick. Just open the package, drain the liquid, rinse briefly under running water, then let them air dry for a few minutes while you prepare your sauce. That’s it; dinner’s done! How Do Shirataki Noodles Compare to Traditional Pasta? As I said earlier, they’re not an exact replacement for traditional wheat pasta. You’ll never get that “al dente” bite or the thick and “meaty” feel of semolina pasta. However, they come in many shapes and sizes and can be used to closely replicate traditional pasta dishes. Personally, I find them more useful in Asian cuisine. However, I’ve grown rather fond of the spaghetti-type low carb noodles as well. A few minor adjustments to my classic Italian sauces help them really shine. My kids even like them. Are Shirataki Noodles Low in Carbs? How About Calories? Yes and yes! Those are two major selling points for these noodles. With carb counts as low as 0 – 3 grams per serving and 0 – 10 calories per serving, they’re an impressive way to fill up. There are some higher carb and calorie variants available, but even those come in under 30 calories and 5 grams of carbohydrates. Where Do I Buy Shirataki Noodles? It used to be tough to find these tasty treats where I live. I had to travel a bit to purchase them at an Asian market an hour from home. However, as they’ve grown in popularity, their availability has increased, too. Amazon carries many brands, and you can often find them locally at regular grocery stores. How Do I use Shirataki Noodles in My Cooking? I could write a whole novel on this topic alone. These noodles are so versatile, you can use them in any recipe. Hot, cold, sweet, savory, you get it all here because the noodles have no flavor of their own to spoil your carefully crafted sauces. 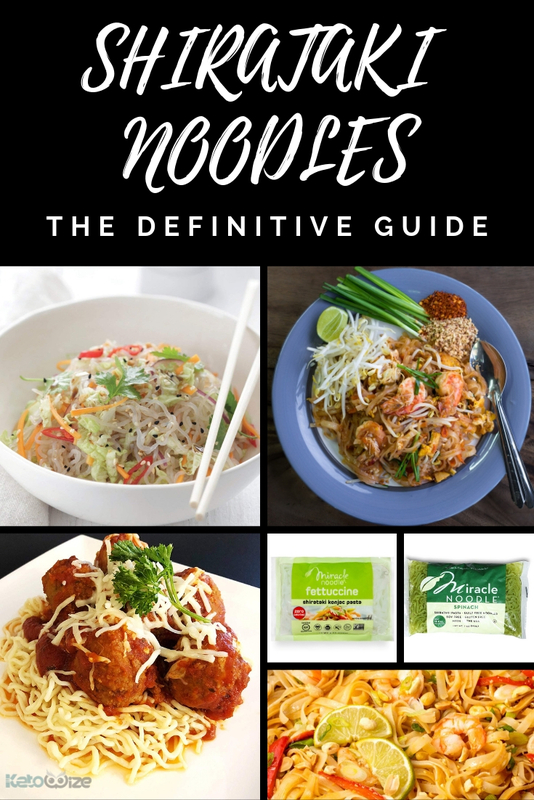 Since you probably don’t have time to read 500 pages of low carb noodle recipes, here’s a short list of my favorites to get you started. Not sure how to get started with low-carb noodles? Jumpstart your creativity with these yummy recipes. Sometimes I just need that decadent taste and texture of shrimp and Alfredo sauce. With this recipe, you skip the heavy, carb-loaded wheat noodles for lighter Shirataki, which leaves more room in your calorie count for extra shrimp! Garlic, lemon zest, and pepper add a nice depth of flavor. I’m a soup lover and this recipe has everything I love about a noodle soup…except the carbs and calories of wheat noodles! Savory, beefy broth, silky noodles, and a touch of ginger are a perfect mix to relax me at the end of a busy day. It’s versatile, too! If I don’t have slices of beef or leftover meatballs, I can use regular ground beef, which I always have in my freezer. Need a quick, delicious, and filling meal for a weeknight? This dish can be completed in about 10 minutes and leaves you feeling full and satisfied. Almond butter, garlic, and onions mix to give this recipe a familiar peanut sauce taste. You can mix things up with different veggies, too, so experiment! Is there anything yummier than fresh Pad Thai? I think not! How about making it lower carb and lower calorie without skimping on flavor? That’s what this quick recipe promises and delivers. It’s great with shrimp or chicken, though I plan on trying it with other protein sources, too. You’re not imagining things. I’m really going to show you a low carb, low calorie Shirataki recipe for Whoopie Pies. Brace yourself for an impossible delight with a mere 28 calories and 2.5 grams of net carbs. I’d love it if you believed me, but I know that proof is vital to making a valid point. So, I did some legwork for you, scouring the Internet for reviews on these miracle noodles. Of course, some people won’t like them, and that’s okay, but the evidence of their taste and effectiveness is clear when you see these other reviews. Maya Krampf over at Wholesome Yum did a great review last year. While she focuses on the Skinny Noodles brand of low-carb noodles, she also goes pretty in-depth with other types of Shirataki Noodles. Kristy over at The Wicked Noodle put together a review of the Miracle Noodle brand of low-carb noodles back in 2009. While this appears to be a sponsored review for the product, she gives some great info in the post. As is usually the case, the the more unbiased information is in the comments section. Finally, the Miracle Noodle website has over 750 verified reviews from customers claiming to love these low-carb noodles. If you take a little time to read through them, there are some great (and creative) preparation tips in there. On your quest for low carb pasta substitutes, you don’t need to stop at the miracle noodle. Other options exist, and I think you should try them all. Depending on your nutritional requirements, taste buds, and adventurous nature, some of the following alternative low carb noodles might appeal to you. Spaghetti squash comes in as my favorite Shirataki substitute. Simply roast (or microwave), split the squash, then pull the natural spaghetti-style strings out with a fork. Unfortunately, the biggest drawback to spaghetti squash is the time involved. A big squash can take upwards of an hour to prepare in the oven. Zoodles are my next choice. Using a spiral cutter or the spiralizer attachment on certain kitchen machines, you can create fun, springy, yummy noodles. They are often available pre-cut in stores, too. Low carb egg noodles are also an option for adding variety to your keto diet. They tend to be much more noodle-like and satisfy the texture needs of some people. Be warned, however, that not all low carb egg noodles are created equally. PRO TIP: Be sure to check the nutrition labels. I really didn’t mean to become the poster child for Shirataki. However, once I tried the noodles and experienced the benefits myself, I realized other people might be interested, too. For me, these noodles really were a miracle. Also, they’re not an exact replica of my beloved angel hair pasta, but they’re close enough for me. I can still feel that happy buzz of enjoying my favorite pasta meals with my family, but without the guilt of carb-loading and derailing my progress toward a healthier me. They’re low carb so I can stay in ketosis and continue to enjoy the benefits of the keto lifestyle. Low calorie means I can eat more of them without the guilt of higher calorie wheat pasta, and I’m finally full. The digestive assistance of high fiber keeps me regular, which means no more embarrassing trips to the doctor for constipation relief. And, best of all, I’ve lost weight using these noodles as a regular part of my diet. My doctor is thrilled with my progress and has said I’m not at risk for diabetes any longer! If any of this sounds appealing to you, it’s worth a shot trying these low carb noodles. Maybe you’ll jump on this bandwagon and help me sing the praises of this food miracle so more people can reap the benefits with us.